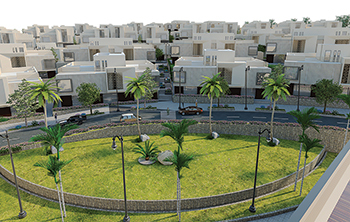 Al Muna Gardens ... SMC Infra will build 122 villas of four categories. Oman-based Zain Property Development has awarded the contract for Al Muna Gardens, the first-ever green residential complex in the heart of the sultanate’s capital, Muscat, to leading contractor SMC Infra, reports the Times of Oman. Al Muna Gardens project will consist of 122 villas divided into four categories and surrounded by green spaces. As per the deal, SMC Infra will complete the project in 33 months. “We are well equipped with the best of the technical, engineering and managerial skills and are confident to handover to the client within the designated time,” he adds. The Al Muna Gardens will have an attractive entertainment centre that will include a gym with swimming pool, nursery for children, a cinema theatre, and commercial spaces for rent suitable for the establishment of a cafe, spa, restaurant, clinic and mini market. The project also has green areas and outdoor spaces for bowling, chess, football, weightlifting, hiking and cycling The city will have several entrances and exits, enabling the residents to access their villas smoothly and to ensure absolute security. The city will be provided with 24 hours’ security, as well as surveillance cameras and a waste disposal system.